To use this plugin, Windows users must install Version 7 of ImageMagick. Mac users do not need do this since the plugin includes its own version. Download and unzip LR/Mogrify 2. You should now have a plugin called 'LR2Mogrify.lrplugin'. Choose "LR/Mogrify 2" from the list of plugins. 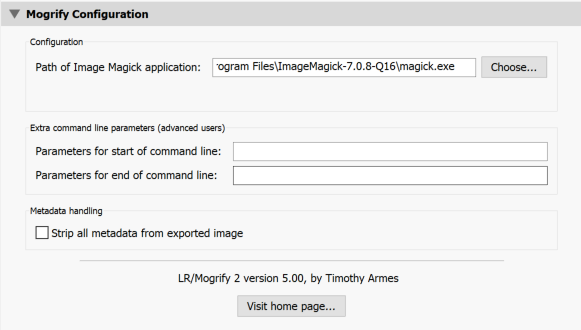 Windows users now need to tell the plugin where to find ImageMagick's magick application. Go to Lightroom's Library module, click on any image and then press the Export button. On the left side of the export dialog box, under 'Post Process Actions' double click on 'Mogrify Configuration'.